It is said that character is attained not through our victories, but through our defeats, not through our moments of greatest triumph, but in the aftermath of our embarrassment. I love it when we say that something was a “learning experience.” In general, it means that something cost us more than we anticipated, either in time or money, or that it didn’t pay-off as we had hoped. So when we call something a “learning experience,” we are proudly raising a half-empty glass and calling it half-full, toasting our public chagrin, celebrating a debacle that will do nothing more for us than add to our character. And in this resolve, we understand that success is not measured simply in terms of the spoils, but in something deeper that we take away from a disaster. There are dividends buried like treasure beneath the surface of a catastrophe of this sort, and so if we calculate a defeat in terms of the character that was purchased for us, then we are the winners. Throughout my life, I have tried to become one who laughs in response to my humiliation, partly because it takes away the sting a little bit, but also because it helps me remember not to take myself so seriously, and it chips away at my hubris. Who could not laugh when pride comes before a fall? Pratfalls are standard fair in comedic routines across the ages, and so why not in our own lives? When the fall is one that we ourselves take, then laughing out loud is the only response. For this reason, I have gleefully celebrated one particular humiliating defeat for the last twenty-five years. 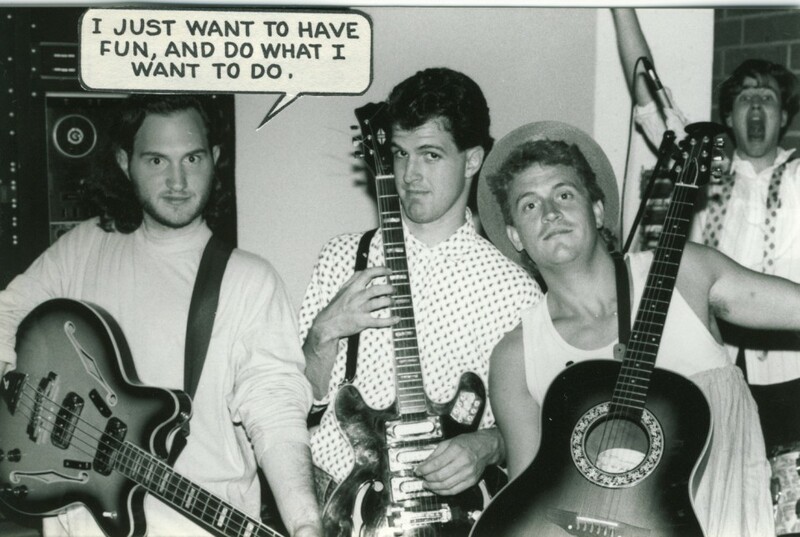 Imagine a rock band of college guys, full of their own prowess and humor, ready to take on the world. We used to say laughingly that we had a “leg up on Elvis.” So when we almost won the “Battle-of-the-Bands” at our university, we had no doubt that our future was bright; it was like a yellow brick road, leading over the horizon, with no hint of the dark forest lurking around the bend. Our over-confidence might have come from the fact that we lost that battle-of-the-bands in style. Following an evening of lackluster performances, we had the audience on their feet, clapping for our rendition of “Here Comes the Sun.” I was singing lead on that song, and I can still remember shouting over that repetitive bridge, “On your feet, sing with us,” egging on the crowd in my best rock star manner. Our first gig would end up being our moment in the sun. 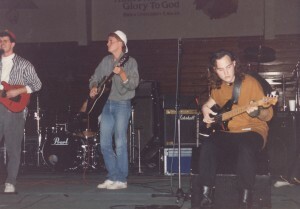 We were subsequently invited by the student council to open for two mid-sized Christian rock bands that would be headlining in our gymnasium a few weeks later. And that’s where the trouble began. That’s where our eyes and our heads got big. That’s where we stumbled. First, we thought that we were the main attraction, and that students would primarily be showing up to see us, the hometown favorite. And so we planned a set that was too ambitious and far too long. We took our not-quite-award-winning setlist and added original material, a dangerous trial run for an inexperienced band. We made plans that were far beyond our capability and, frankly, beyond what the moment called for. As it was December, we planned a rousing finale that was an arrangement of the seasonal Band-Aid favorite, “Do They Know It’s Christmas?” complete with percussion, flute, chimes, cello and back-up singers. Yikes. Second, we took ourselves way too seriously. There is nothing more annoying than a rock band thinking they should make a statement, believing that they can change the world by their angry young antics. We were the absolute pinnacle of pretension. I remember that we had a friend do “art” across the gymnasium floor as we drove fast and furious through The Police favorite, “Driven to Tears.” As he painted protest slogans on the floor in front of us, we hung on for dear life to the runaway rock anthem. Third, we hadn’t thought through the logistics of our choices very carefully. It took forever just to finish set-up and soundcheck, with equipment from the other bands crowding the platform. When we finally took the stage, we rolled through our first four numbers in record speed, our nerves pushing the tempos faster and faster. Whatever momentum we had gathered came to a grinding halt, however, when we hit our finale. Because of our grandiose plans by way of instrumentation, the sound personnel had to do a huge sound reset in order to get the cello, chimes, etc. dialed in. I remember seeing the cellist slowly tune his cello as the audience looked on, my inner clock going twice the speed of the unfolding events. It took about fifteen minutes before we could even start the song, which was supposed to be the poignant and emotional pinnacle to our triumph. The audience was more than restless. The other bands were furious. And we were…shaken. Fourth, the monumental undertaking of this final song had never been rehearsed with everyone present. Instead of a polished encore, we were treating the crowd to a first run-through, as the earth-shaking climax to our success. That’s like walking on a tightrope between two buildings without ever having practiced on the ground. The chances of falling are extreme…and we took a nose dive right off the wire. Our lead singer—who chose to switch to acoustic piano for this final number—was so shaken, that he skipped the first pre-chorus, throwing off all of the players who were reading music. So while the band could follow him, the chimes, percussion, cello and back-up singers kept on going, oblivious to the error. While we were singing “Feed the world,” the rest of the ensemble was still wondering what continent we were on. And then the final disgrace. Given that the cello was taking care of the bass line, the bass player—me—had decided to put down his guitar, pick up a stick, and play one of the floor toms. This was more than a false move—it was blissfully dancing on the abyss. Forget about the fact that I had never played drums before; we were cursed by our own arrogance. And so as we cruised down the homestretch of that tune—what should have been the emotional climax—the ultimate embarrassment of the evening occurred: one of the legs of that large floor tom collapsed, sending the drum rolling out into the audience, nearly into their laps. A huge guffaw arose in the room, and then…yes, applause. Humiliation. Shame. Ignominy. I smiled in defiance and stuck my fist in the air, in my best rockumentary pose, but the damage was done. We were buffoons. We still tease him with that line to this day. There are so many morals to this story that I have only to pick one. Yes, we made countless inadvisable choices in what we planned. But the one that has stayed with me to this day is general, a lesson to take away from this cautionary tale: don’t take yourself too seriously. And be ready to laugh at yourself, because if you join in the laughter, then it doesn’t sting quite as much. 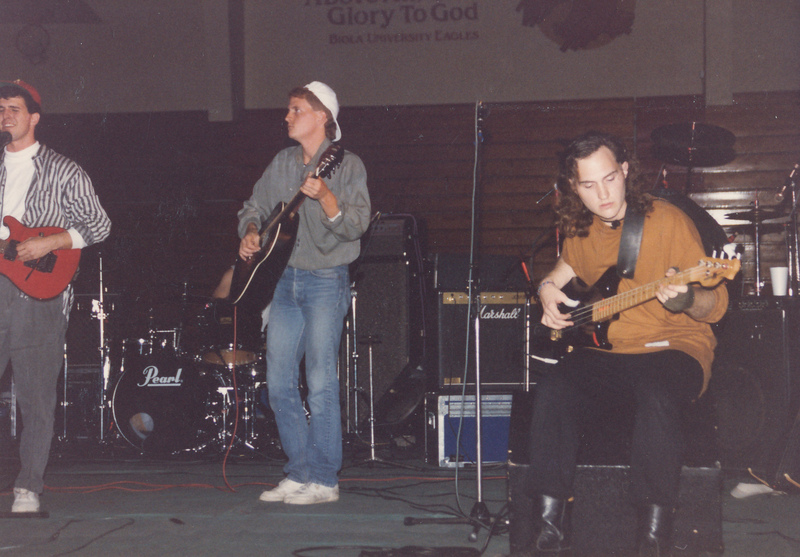 And so, for the past twenty-five years, the members of this now defunct band call each other every Dec 3rd, and wish each other a happy day. It has created an even greater sense of love and enjoyment. And we have come to cherish this celebration of our embarrassment. I believe that I will remember these guys and this calamity with love and fondness until the day that I die. And so, it was simultaneously the worst and the best Christmas gig of all time. Dedicated to Tom Townsend, Shawn Winters, Todd Stark, Darren Rydstrom, my scary roommate Jonathan, Marilyn Arce, Kelly Alvarez, and Eddie the cello guy. I love this story, Dan! Thanks for sharing it. Funny, I was just thinking about the many times I embarrassed myself by my actions, especially when I was in college. It is quite amusing. It is a good to be able to laugh at yourself. I remember when I first learned that embarrassment was based in pride. It was an eye opener. Dan, this was amazing. I loved your reflection and the humor–and humility–you shared. Thank you for making me nearly spit out my gingerbread latte all over my laptop. Oh how far we have all come since those days (well, most of us anyway)! I don’t remember being there, but I can picture it all in my head! Thanks for sharing, Dan!